The Civil War took its toll on Confederate civilians disproportionately to civilians in the North. The role civilians played in the conflict was in many ways just as important to their cause as the role of the soldier. Farms located near or in battlefields were often trampled and livestock confiscated. Homes were taken over and became officers’ headquarters. The loss of family members to the conflict decreased income and injury to civilians and soldiers took a large toll. These profiles offer a glimpse into their lives at that time. This John Wilkes Booth mug is part of our collection of Civil War biographical mugs. An image of John Wilkes Booth and a short biography are features of this history mug. This Belle Boyd mug is part of our collection of Civil War biographical mugs. An image of Belle Boyd and a short biography are features of this history mug. This Mary Chestnut mug is part of our collection of Civil War biographical mugs. An image of Mary Chestnut and a short biography are features of this history mug. This Antonia Ford Willard mug is part of our collection of Civil War biographical mugs. An image of Antonia Ford Willard and a short biography are features of this history mug. This Selina Gray mug is part of a collection of African American and Abolitionist biographical mugs. An image of Selina Gray and a short biography are features of this history mug. This LeRoy Wiley Gresham mug is part of our collection of Civil War biographical mugs. An image of LeRoy Wiley Gresham and a short biography are features of this history mug. 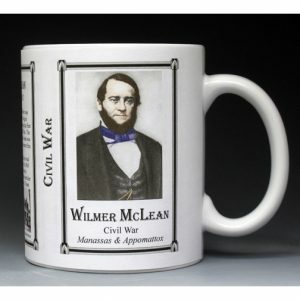 This Wilmer McLean mug is part of our collection of Civil War biographical mugs. An image of Wilmer McLean and a short biography are features of this history mug. 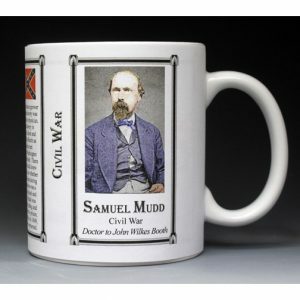 This Samuel Mudd mug is part of our collection of Civil War biographical mugs. An image of Samuel Mudd and a short biography are features of this history mug. This Elizabeth Van Lew mug is part of our collection of Civil War biographical mugs. An image of Elizabeth Van Lew and a short biography are features of this history mug.